While Meharry Medical College is a Historically Black College, the student body reflects the diversity of the nation. Through a generous grant from the Bureau of Health Workforce, a component of the Health Resources and Services Administration, the Center of Excellence addresses cultural diversity. Increase the Competitive Applicant Pool of Underrepresented Minorities for Health Professions School. Expand Program to Enhance Underrepresented Minority Student Academic Performance. Improve Recruitment, Training and Retention of Underrepresented Faculty. Improve Information Resources and Access, Curriculum, Clinical Education and Cultural Competence as it Relates to Minority Health Issues. Facilitate Faculty and Student Research on Health Issues Affecting Underrepresented Minority Groups. Engage Students in Practice-Based Training in Community-Based Settings Serving Significant Numbers of Underrepresented Minorities. Meharry Medical College (MMC) is one of four Historically Black Colleges and Universities (HBCUs) that are specifically designated in statute to receive Centers of Excellence (COE) Program awards under Public Health Service Act (PHSA) section 736(c)(2). Founded in 1876, MMC is the largest private, historically black health science center in the US and a top producer of African American physicians. Currently, only 6.9% of medical school enrollees in the U.S. are African American. The primary mission of Meharry Medical College is elimination of health disparities through deployment of a culturally-competent workforce that can adapt to the population’s changing health care needs and provide the highest quality of health care to all. The medical school proposes strategies addressing solutions to health disparities by increasing the African American physician workforce. This COE addresses the need to recruit and train African American students interested in medicine, while recruiting and retaining African American faculty, who are academically involved in innovative medical education and teaching. 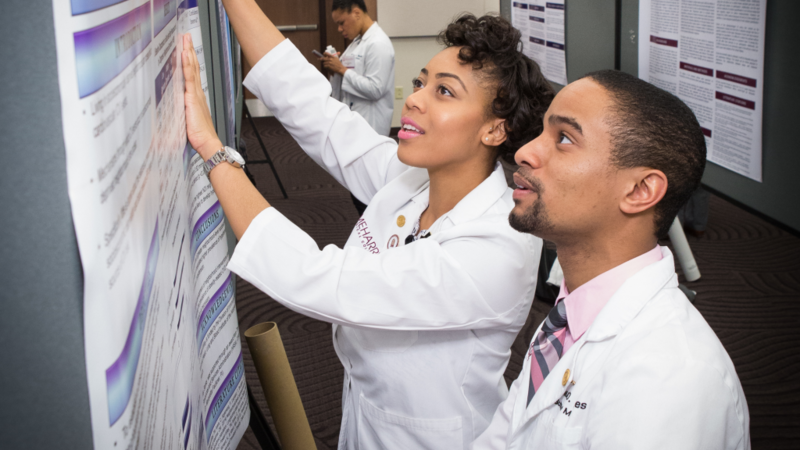 Through its role as a Center of Excellence, Meharry Medical College continues as a leader in minority health education, ever-expanding the curriculum to prepare future physicians to be more effective with an increasingly diverse patient population. The intent of the Meharry SOM’s BS/MD Program is to develop a student with excellent academic credentials, competitive MCAT scores, and the personal, professional, leadership, and psychological attributes to be highly competitive for medical school admission and provide a foundation for training to be a great physician. Through linkages with ten Historically Black Colleges and Universities (HBCUs) – Alabama A&M University, Albany State University, Alcorn State University, Fisk University, Grambling State University, Jackson State University, Hampton University, Southern University and A&M College, Tennessee State University, and Virginia Union University – students majoring in biological sciences or chemistry who matriculated into these universities are invited to participate in the BS/MD Summer Enrichment Program at Meharry Medical College (MMC). Students are selected during the second semester of their first year in undergraduate school by the Site Coordinator at the institution. This six week summer enrichment program, held on the campus of MMC, consists of three sequential levels. Program selection criteria include: 1) African American/Black students; 2) US citizen or permanent resident; 3) an overall and science GPA of 3.25; 4) two letters of recommendation from professors and/or advisors; 5) submitted official transcript with seal; and 6) submitted 1-2 page essay. These Pre-Health Advisors listed are contacts between the undergraduate students and Meharry Medical College. They are also annually trained with the up-to-date knowledge regarding the MCAT and the preparation of the students to successfully take the placement examination. The resources below are additional sources of information to assists in the preparation process. These resources are intended to help the potential medical student began preparing for the exam as they are progressing through their undergraduate courses. Please see the links below for additional study material. First-year Meharry students are provided the opportunity to participate in collaborative research efforts with both Meharry faculty and faculty at other institutions. All research applications require prior approval. The student and mentor are encouraged to design research around basic science, clinical, or health services research focused in childhood obesity, mental health, and opioid abuse research, or on chronic and/or communicable diseases among minority populations; population based/public health issues among URM populations; maternal and child health issues prevalent among URM populations; mental health and behavioral health integration; and access to health care for URM populations. Students’ proposed projects will be evaluated by the Ad Hoc Summer Research Committee, chaired by Research Course Directors. Additionally, each student researcher who conducts research during the summers will be required to present his/her research at the Annual Student Research Day. Because Meharry believes in cultivating passion for health care professions as early as possible, the Center of Excellence’s Pre-health Advisor Program trains and develops advisors to nurture and encourage premedical students. Equipped with relevant, current information, the advisors help premedical students develop a strategic approach to their time and courses of study. Additionally, advisors receive assistance with writing letters of recommendation, organizing a premedical committee to conduct mock interviews for their students, and writing a committee letter. Meharry’s SOM COE offers a High School/ACT Review Program. This seven-week enrichment program is designed for African American/Black, disadvantaged high school students in Metropolitan Nashville and surrounding areas. The program normally occurs during the fall semester, prepares students to take the ACT, and teaches test-taking strategies. The program is primarily for sophomores and juniors interested in healthcare professions or science careers; however, seniors may participate. Classes are held on Saturdays on the Meharry campus and enrollment is limited to 25 participants. Information is disseminated to counselors at Metropolitan Nashville Davidson County high schools and churches. Students must meet eligibility requirements for the program. Students must be: a U.S. citizen or permanent resident; complete program application; submit official high school transcript; have a minimum cumulative GPA of 2.75; agree to take the ACT at the end of the program and forward a copy of their score to the program office. Based on the criteria, the Program Coordinator selects the participants and the prospective students/parents receive an acceptance letter and all requisite paperwork (class schedule, consent and release forms).